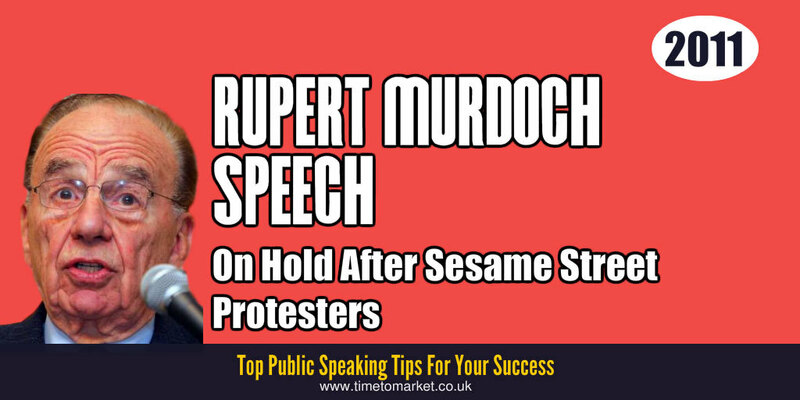 Taking their cue from the Occupy Wall Street protestors, a small group of activists self-styled as Occupy Sesame Street, forced a break in Rupert Murdoch’s conference speech this week. The Chief Executive of News Corporation was speaking about technology and public education when protestors interrupted the Murdoch speech. He was speaking at the National Summit on Education Reform in San Francisco when the Occupy Sesame Street activists began their protest about the privatization of public education. Their protest comprised a series of individuals standing up, holding a placard and shouting. For maximum effect, each protestor took it in turn to rise to their feet and make a protest from within the selective audience. As a form of rolling protest it seemed novel, if not effective. And quite dissimilar to the one man protest at the Secretary Clinton speech at George Washington University. It didn’t have much impact on the speaker. Mr Murdoch remained bemused by the unfolding spectacle in the auditorium. After some delay he continued with his speech once security guards had ejected the protestors. So, at least they got things under control so the Murdoch speech could continue. Because sometimes they don’t manage that. This was really notable with the Ali Larijani speech in Iran, when the Speaker of Iran’s Parliament had to be escorted away from the podium for safety! You can discover some great public speaking tips with our regular series of top tips for speakers, podcasts and videos. For example, you might want to learn how you can manage interruptions in your speech. Because you can do it. It really is possible. Plus, when you want to boost your confidence levels and your public speaking skills that bit further, then why not consider a course? Because some serious training always pays dividends. So, when the time is right, please don’t hesitate to get in touch.